At the Brit Awards earlier this week our English talent won the award for Album Of The Year for her album ’21’ released back in January 2011. Unfortunately, just a few seconds into her acceptance speech while she was waiting for the audience applause to die down, event host James Corden was asked to step in and cut her off while awkwardly saying, “I’m so sorry, I can’t believe I’m about to say this…” Before he could elaborate further, Adele said, “You’re cutting me off!” and then added, “Can I just say then, goodbye and I’ll see you next time round,” before shrugging and raising her middle finger high in obvious annoyance at the bigwigs controlling the event who had made the decision to end her speech embarrassingly early. Blur immediately began to play the closing set. Now it’s a sad, sad thing that she didn’t get to make the most of her moment in the limelight, especially well deserved after a phenomenal year of working her socks off promoting her album and carrying out live performances, but it would appear that due to Blur’s front man Damon Albarn rambling on during his indulgent acceptance speech – the longest of the night – for Blur’s Outstanding Contribution to Music/Lifetime Achievement award, there just wasn’t enough time left for Adele to give her full thanks, although thankfully she was allowed the time to give a live singing performance earlier in the night. The Brits were originally scheduled to run from 8pm until 10pm on ITV1, but ended up overrunning by a monstrous seven minutes in order to fit in as much of Blur’s five-song finale as possible. However, even Blur felt the time cull as their most widely known hit Parklife was faded out and the final song was moved over to ITV2 to make way for the News at Ten back on ITV1. I find it odd that something like football/soccer is allowed to overrun and the following show is cut in order to fit the remaining time, however something like the Brits isn’t given the same level of importance. Maybe this is a gentle nudge towards moving the Brits over to the BBC who don’t have to fit in breaks for adverts and have the potential and power to run this sort of live show a little more successfully. 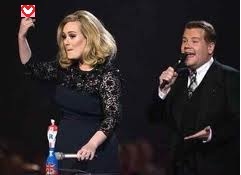 With this being a live TV show, the criticism should not be on host James Corden who was simply following instructions to end Adele’s speech early, neither should it fall on Blur who were allowed to talk on for too long, but instead should fall squarely in the laps of the ITV producers who didn’t factor in human nature. They should have either allowed the show to overrun by a few minutes OR plan in advance for it to run short and have filler arranged if t hey found themselves in the fortunate position of having excess time on their hands. The Brits have a history of overrunning, so there’s no excuse for this not being part of the pre-show plan and ITV knew they would face a horrible fine if they allowed their show to overrun by too much time. I don’t agree that cutting Adele short was a sexist move at all. If anything it’s a case of Good vs Evil…or rather Good vs Ego. Adele is industry renowned for being a nice person, a good person, a healthy role model for budding artists. For goodness sake, she provided my very wholesome main song choice at my wedding. Unlike the raunchy, overly sexed up outfits and antics of female performers of her generation, she dresses modestly and appropriately for her singing style and maintains a classy, ladylike face with regard to needlessly cruel comments about her figure. Regardless of people trying to vilify her relationship with still-married-but-separated father Simon ‘Swampy’ Konecki, Adele has retained an un-divalike attitude and refrained from courting controversy in an attempt to raise her media profile, or falling off the rails, in refreshing contrast to other female artists or her fellow attendees of the London School for Performing Arts & Technology (aka The BRIT School for Performing Arts & Technology) Amy Winehouse or Jessie J. We all know the saying, ‘Nice guys finish last’ (the phrase coined by Baseball manager Leo Durocher back in 1939 when he said of the opposing team, “Take a look at them. They’re all nice guys, but they’ll finish last. Nice guys. Finish last.” If you’re nice, no-one is going to worry too much about offending you; if you’re sweet natured no-one is going to be too concerned about stepping on your toes; if you’r e not a musical diva then a show’s producers aren’t going to lose too much sleep over completely cutting off your big moment. To be fair, although Album of the Year is a wonderful award to get, the Lifetime Achievement award handed to Blur has a larger significance attached to it as it isn’t handed out every year and only given when an artist is judged to be truly deserving. 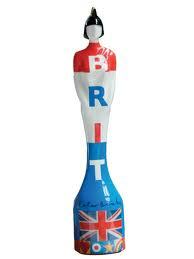 Prior to Blur, it has been awarded to the likes of Queen, Paul McCartney, David Bowie, Paul Weller, The Spice Girls and U2 (listed by order of my approval, not by year awarded), and although the Brits bill the event as if the Album of the Year award is the grand finale, the Lifetime Achievement is clearly the bigger prize. 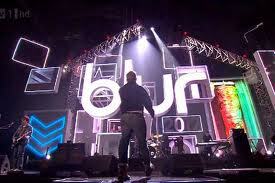 At the end of the day, Blur won the biggest award that the Brits have to offer and as a result, in accordance with all past winners, time needed to be reserved to allow them to see out the show as the final musical performance in order to remind everyone of why they walked off with this award. It’s a horrible shame that the time cull came at the cost of Adele’s big moment, and although ITV have issued an unsurprisingly prompt apology it’s not going to go over well with Adele or her fans, however this is simply a case of bad planning, bad forecasting and bad timekeeping and not some big statement on the attitude towards woman in the music industry. Like the post and lol’d at Lilly Allen motor mouth. I thought that chav had dropped off the planet. Nothing like the chance of attention to bring the grubs out of the woodwork! Next Post Suicidal Eggs: Clever Advertising Campaign Or In Poor Taste? Previous Post Another Tragic American School Shooting. Why So Many?